A new CD, which saw some of Melbourne’s top young classical and jazz musicians coming together for an ambitious recording project staged at St Andrews Anglican Church, Brighton is now on sale. This was a new experience for many of the young artists involving being the first time they have been given the opportunity to record at a professional level. The CD features 13 tracks in all showcasing the fruits of a new collaboration between flautist Jessica Zuk, Surf Coast pianist and composer Callum Watson and clarinetist Joel Hands-Otte. Works include three new piano trio compositions by Callum presenting a mix of both jazz and classical influences. Hands-Otte also contributes a profound bass clarinet arrangement of the jazz standard “God Bless the Child” written by Billie Holiday. The CD concludes with an innovative new arrangement of Vivaldi’s G minor flute concerto “La Notte” for flute and string quintet conceived by Melbourne composer Scott A. Aschauer. “All works on the release have been specifically orchestrated with the fine St Andrews acoustic in mind” says Callum. “Orchestrations play on the reverberance and enhanced musicality that the amazing space provides”. 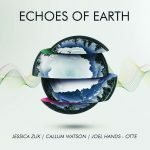 To launch the CD in Geelong, Jessica and Joel who are featured on the album are premiering a new composition by Callum Watson called Earth, Wind and Fire which will be performed between 6:30 and 8:00pm at Geelong After Dark on May 4th. CD’s will be available for purchase at the performance.